Welcome to the Spring 2012 newsletter from Rhys Vineyards! This offering focuses on the 2009 wines produced by our foundational Alpine Vineyard. Each year, we feel that Alpine Vineyard’s Chardonnay, Pinot Noir and Swan Terrace are some of the finest wines we produce and the 2009 vintage is no exception. While we love the wines, growing grapes at Alpine is no easy task. The steep slopes and capricious microclimate make Alpine one of our most difficult sites to farm. In particular, the weather during June is often extremely challenging. The cool, wet weather pattern often interferes with grape flowering which results in a very small crop. Fortunately in 2009 Alpine experienced mild conditions during this crucial period and produced excellent yields of about 2 tons per acre. While this is still considered a low yield for closely spaced Pinot Noir, two tons per acre at Alpine is cause for a lot of excitement around Rhys! This excitement continued throughout the summer as we enjoyed mild weather and the dry soils continued to concentrate flavors. The biggest test of Alpine’s 2009 vintage arrived on the eve of harvest. Just as the Pinot Noir was finishing ripening, one of California’s notorious late-season heat spikes appeared. In order to pick the grapes at optimal ripeness, our team made a herculean effort and the majority of the vineyard was picked quickly over two nights. This is a particularly amazing accomplishment when considering Alpine’s extremely steep slopes! After malolactic fermentation finished, we carefully evaluated the individual quality produced by each vineyard block and only 60% of the barrels were used to create our 2009 Rhys Alpine Vineyard Pinot Noir while the best of the declassified barrels were used in our first ever 2009 Rhys Santa Cruz Mountains Pinot Noir bottling. Now that the wines are in bottle, our 2009s show a consistently forward, concentrated and charming personality. Compared to the more firmly structured 2007s and 2008s, the 2009s will be much more appealing to drink at a young age. This approachable personality does not mean that the 2009s are exclusively “early drinking wines”. Their ripe structure, beautiful depth and balance should allow them to age effortlessly and improve for more than a decade. Always a customer (and winery!) favorite, the 2009 Chardonnay from Alpine Vineyard showcases the rich fruit of the vintage combined with the focus, complexity and minerality intrinsic to Alpine Vineyard. Citrus peel, stone fruit, lanolin and saline notes are evident in the nose, while the palate simultaneously shows power and focus, leading to a long mineral infused finish. Showing its youthful side right now, this Chardonnay should continue to improve for the next 5+ years. Following on the heels of its 2008 counterpart, the 2009 Alpine Pinot Noir is one of our most promising wines of the vintage. Also like 2008, we chose to add the hillside component into the Alpine blend. This bottling showcases all of the hallmarks we associate with wines from Alpine: iron-laden wild black and red fruits, distinct spice and floral elements with a characteristic dry chalky minerality on the finish. While approachable now with a few hours in the decanter, this is a wine that should mature gracefully for the next 7-10 years. Our Swan Terrace bottling is consistently the “feminine” counterpart to Alpine Vineyards more “masculine” personality. While this wine always exhibits very fresh, elegant red fruit, we feel that the harmonious blend of delicate rose petal aromatics and pronounced chalky minerality really make the Swan Terrace so special. As always, the Swan Terrace is a wine to age, and should improve for the next 7-10 years. Our first Santa Cruz Mountain appellation Pinot Noir is a careful blend of barrels from both our Alpine and Horseshoe vineyards. Since our estate vineyards are producing more and better wines each vintage, we have begun making stricter barrel selections for the final single vineyard wines which allows us to put together excellent blends like this one. This Pinot exhibits the same hallmark characteristics of our single vineyard wines, with abundant spice and floral aromas and flavors, fresh red fruit and pronounced mineral notes through the long finish. It is approachable now with air and will continue to improve for many years. 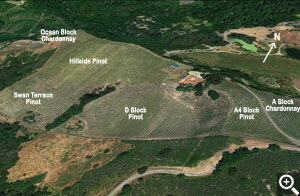 Overview of Alpine Vineyard’s Blocks. The site we now call Alpine Vineyard was Rhys’ first property that was deliberately purchased with the hope of making great Pinot Noir. After studying the geology and weather patterns of the northern Santa Cruz Mountains, this hillside seemed to have all the right characteristics, though we really didn’t understand how difficult it would be to develop the steep slopes. The property contained a dilapidated house that had been a ‘party pad’ for a flamboyant San Francisco restaurateur. The grounds were in disrepair since the attempt to install a Japanese garden had been abandoned. Much of the hillside had become overgrown with a non-native bush locally referred to as ‘greasewood’. Clearing the property and planting the steep slopes proved to be an enormously costly challenge and the development was not completed until 2004. 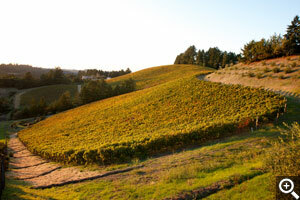 Alpine Vineyard sits on an amphitheater-like hillside about 9 miles from the Pacific. The shape of the hill provides three different exposures to the sun. Since the entire vineyard has uniformly shallow soils, solar aspect is the primary difference between the various sections. The vineyard features two east-facing sections ‘ A Block Chardonnay and Swan Terrace Pinot. Other than the west facing Ocean Block of Chardonnay, the remainder of the vineyard has a southern exposure. 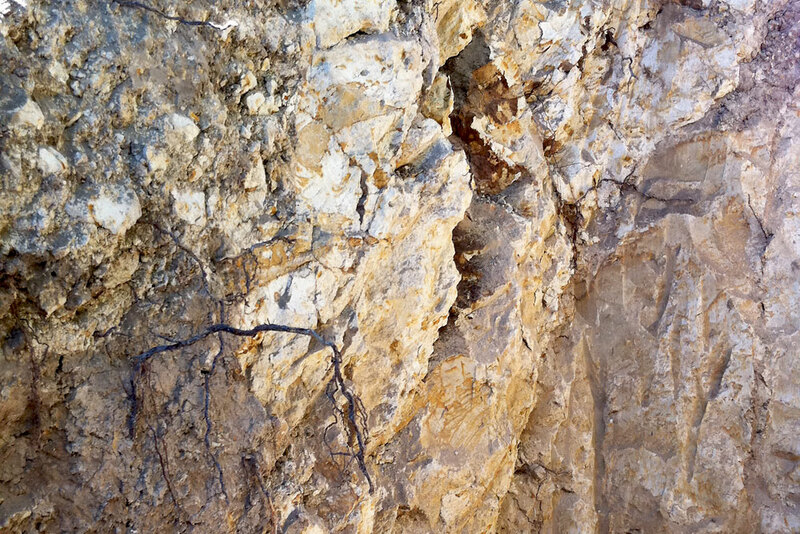 The soil depth averages 18 to 36 inches above a soft, white, rust mottled marine shale called Purisima Formation. While Pinot Noir is Rhys’ most widely planted variety, surprisingly, in 2001 the first vineyard block to be planted at Alpine was Chardonnay. Just one acre in size and facing due east, the soil depth and aspect are similar to some of Burgundy’s most exalted Chardonnay sites. The moderately spaced Chardonnay vines are comprised of a combination of cuttings (Hyde Selection, 76 and 96) and have been dry farmed since 2008. With over 7 vintages now in bottle, we feel that this small block has proven to be a remarkable site for Chardonnay producing wines of uncommon intensity, balance and signature saline mineral complexity. 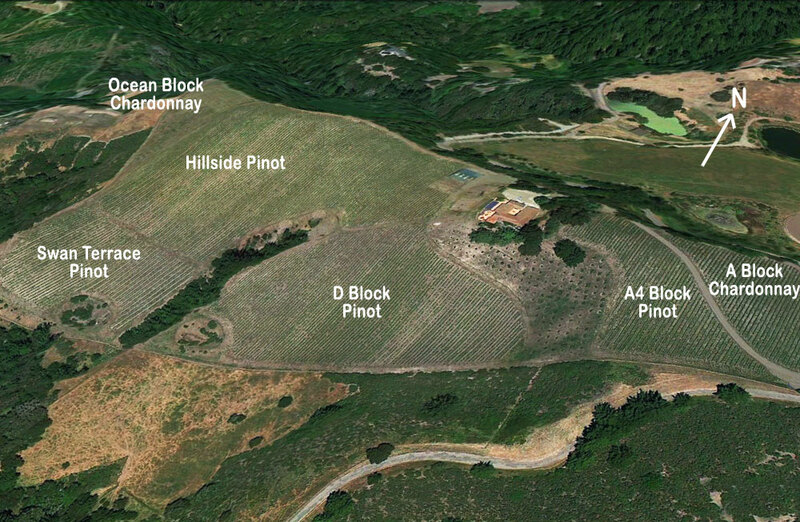 The Ocean block is the only west facing section of Alpine Vineyard. Planted in 2004, it began to contribute to our Alpine Chardonnay bottling in 2008. The low yielding, western aspect seems to produce a slightly ‘cooler’ fruit profile but overall the personality of this block closely mirrors our Block A Chardonnay. While we feel that this block has outstanding potential, it remains a ‘work in progress’. Originally planted in 2001 with poor quality nursery material, the block was replanted in 2002 with better cuttings from the Dijon 777 clone. After several vintages of comparison with other blocks of Alpine Pinot, we decided that this particular clone did not do a good job of reflecting Alpine’s unique personality so in 2008 the block was re-grafted to a selection of small berried clones of Pinot. Now that the vines have been rebuilt, we hope to see some great results in the near future. As anyone who has peered over the edge of these vines will attest, the D Block is extremely steep and somewhat intimidating. This was the last area of Pinot Noir to be developed on the property and it has provided the backbone of our Alpine Vineyard designated Pinot Noir since 2006. Of the three original clones planted in this section, both Swan and Pommard have proven to reliably produce high quality Pinot but we have recently decided that the Calera section is too inconsistent. 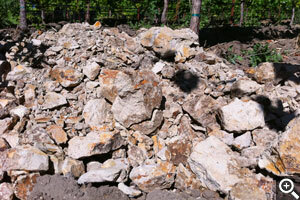 Rather than replacing it with more Pinot, the Calera section will be regrafted to Chardonnay in 2012. 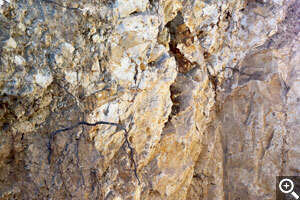 Thin topsoil and soft, blocky shale that comprise the Hillside Block. 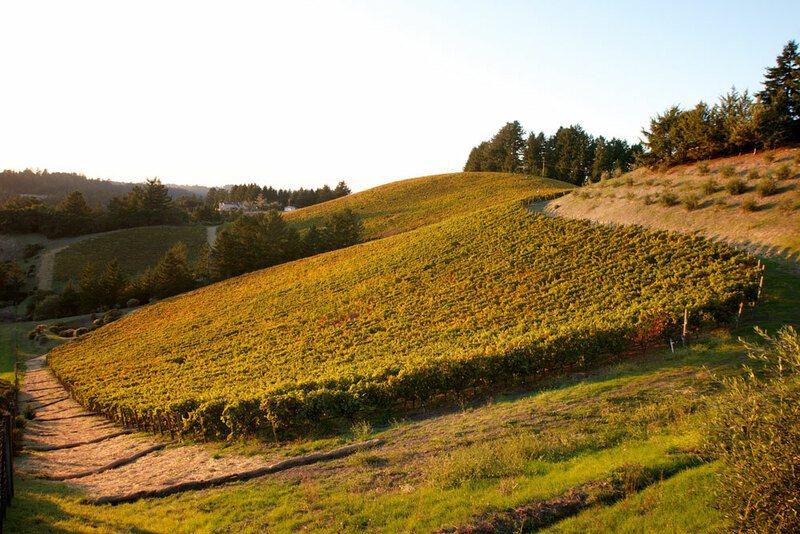 With over 17 clones of Pinot Noir organized in small blocks, Alpine Hillside was designed to be an experimental plot for evaluating the performance of many different clones of Pinot Noir. The heart of this section is even steeper than the D Block and has some of the shallowest soils on the property. The resulting struggle produces some of the smallest Pinot Noir grapes we have seen. In 2006 and 2007, this intense and concentrated wine was bottled separately as ‘Alpine Hillside’ but in recent vintages these grapes have been used in our ‘Alpine Vineyard’ designate. Over the years, the evaluation of the various clones in this section has helped us make optimal choices of vine material for use in our newer vineyards. Now that our evaluation is complete, we have begun regrafting the weaker selections of Pinot Noir over to the clones that have proven to make the very best wine. In total this will mean replacing about 50% of the Pinot Noir scions in this section. From the beginning it was clear that the Swan Terrace was something special. In this corner of the vineyard the hillside veers sharply to the south creating a unique eastern exposure. The vine rows are cut directly into the rocky slope producing a terrace of east facing vines in very shallow soils. From the first vintage in 2006, the Swan Terrace showed an unusual elegance and sophistication. The high toned red fruit, floral aromatics and rocky finesse of this section result in a long lived wine that is one of our very best examples of Pinot Noir. Allocations at Rhys are based on aggregate purchase history. If you are not allocated all of the wines that you would like, please select a “Wish Request” quantity on the order page, as we are often able to fill these requests. As usual, all wines are offered with free ground shipping and upgraded shipping is offered as well. Additionally, we will be hosting a pickup day at our Skyline cave on Saturday, March 17th from 10AM – 3PM. If you would like to attend the pickup day, please be sure to select “Pick­­up at Winery” shipping option during checkout. We look forward to seeing you! Follow our harvest and happenings at twitter.com/RhysVineyards.